PEAKE Barbecue – Like Texas. But closer. In Simcoe Country, there’s only one place to get authentic central Texas barbecue. That’s Peake Barbecue in Alliston. You’ll find brisket—cooked low and slow over wood smoke—as well as sausages, sides and sweets to satisfy any sized appetite. And everything is raised and ranched locally whenever possible. 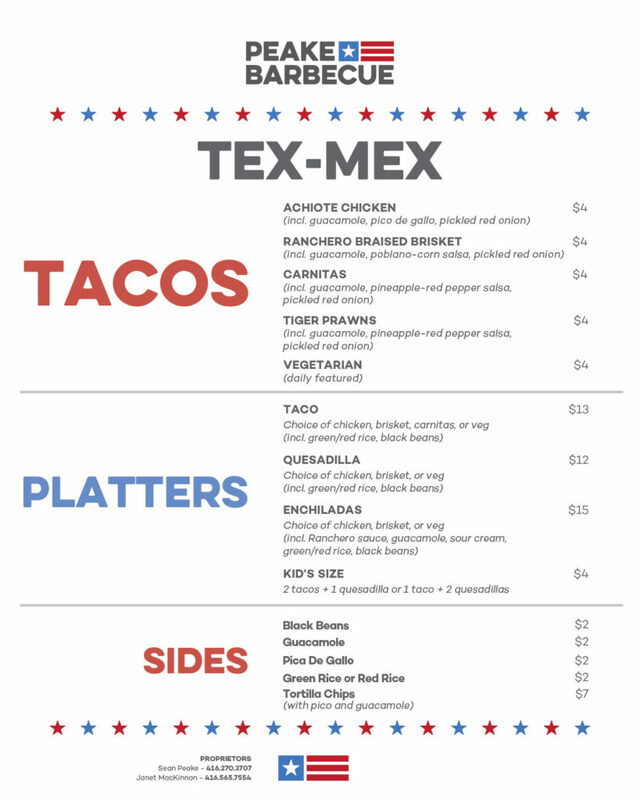 Wednesday to Saturday, we also have a Tex-Mex menu – click here to see our regular Tex-Mex items. All our meats are smoked on the premises using oak and maple logs. We do one cook every day and when we run out, that’s it until tomorrow. So get here early. EAT TOGETHER – IT’S MORE FUN! We’re at 29 Victoria Street West in Alliston. We’re just a short detour off Hwy 400 and Hwy 50.